Ari Folman, director of the acclaimed animated foreign film Waltz With Bashir, has been hard at work on his fourth feature length film, The Congress, and we finally have a fruit of his labor. 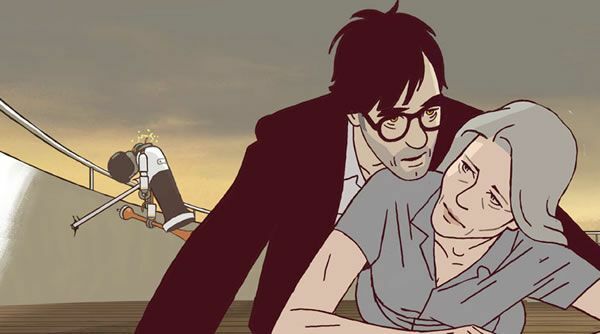 /Film grabbed the image, depicting an animated and aged Robin Wright. The film is loosely adapted from the Stanislaw Lem short story, The Futurological Congress. The short story stars Lem’s frequent male character, Ijon Tichy, who ends up in a world where the Utopian society isn’t quite what it seems as psychoactive dugs are used as weapons and hallucinogenic drugs replace the cold reality. Notice the gender of the character in the film and the story differ. That is because Folman is adding his own take on things and has made the main character female. For the full image, more plot details, and when the film will screen, hit the jump. The current method in which the film will be made is unknown, but it is fairly obvious that portions will be animated. Slashfilm did a lot of the ground work, as they found bits and pieces from past interviews that give us a hint at the direction Folman is taking. Originally conceived as a mixture of live-action and animation, Folman told THR in Dec. 2008, “Think of your favorite young actress. She’ll appear that way at the beginning, and then as the film goes on, she’ll be drawn like she’s 50.” You can check out the first image from the film to your right. Click on it for embiggening. All of this lends itself to the image we have, and one can only assume The Congress will follow the main female character for a number of years. My line of thought is that instead of the main character of Lem’s short story, who just finds himself plopped into the strange world, we will be given the tale through the eyes of a native of the wild world that Lem created. Meanwhile, ScreenDaily reports that the film is set to premier at Cartoon Movie, an animated film festival in Lyon France setup to sell…animated films. Over 50 different films will be showcased for buyers and the festival runs from March 3-5. The Congress is labeled as a film “in development” on the site.